Bison Bede Classic Straight Stairlift from Bison Bede is so simple to operate and safe to use. 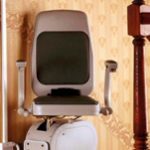 No other stairlift has received greater care in design to achieve passenger comfort and ease of use. Easy to install with no disruption to home decor. The optional battery driven version recharges continuously. Its powerful long life batteries are concealed within the body of the stairlift. With an adjustable seat and comfortable back rest, the Bison Bede Classic straight stairlift is simply controlled using its arm mounted joystick. The 'Call and send' facility for a battery operated Classic is by remote hand held controls. If the stairlift is mains operated then wall mounted push button controls are provided at the top and bottom of the stairs instead. The Bison bede classic straight stairlifts swivel seat is covered in flame retardant fabric in any one of six pastel colours. 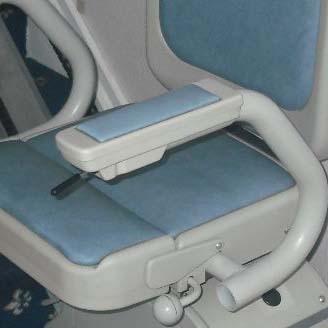 Each seat is equipped with a fixed safety lap belt or an optional retractable belt. The seat folds back when not in use to allow stairway access by others. The Bison Bede Classic straight stairlift is equipped with either a fixed position seat or one able to turn 45 and 90 degrees, allowing even safer dismount at the top of the stairs. 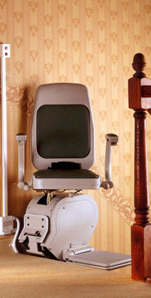 Strategically positioned around the Bison Bede Classic stairlift are Footrest and carriage safety edges. These are designed to stop the lift instantly on meeting an obstruction. 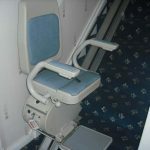 Should the users feet slip off the footrest or an item such as a walking stick fall in its path, then the stairlift will come to an abrupt stop immediately upon contact. All Bison Bede Classic straight stairlifts are fitted with an overspeed govenor, safety brake and hand winding mechanism in case of breakdown. The Bison Bede Classic travels on a wipe clean, maintenance free, polished aluminium rail that does not over hang at the top of the stairs. Where the bottom stair is immediately adjacent to a doorway, a hinged rail can be provided that incorporates a fold back section. The Bison Bede Classic straight stairlift incorporates every conceivable safety feature in an ergonomically designed package, the heavy duty model being able to convey up to 25 stones (159kg) in weight.